While the treatment is effective at addressing acute episodes of SAD, a SAD-tailored version of cognitive behavioral therapy (CBT) is significantly better at preventing relapse in future winters, the study found. 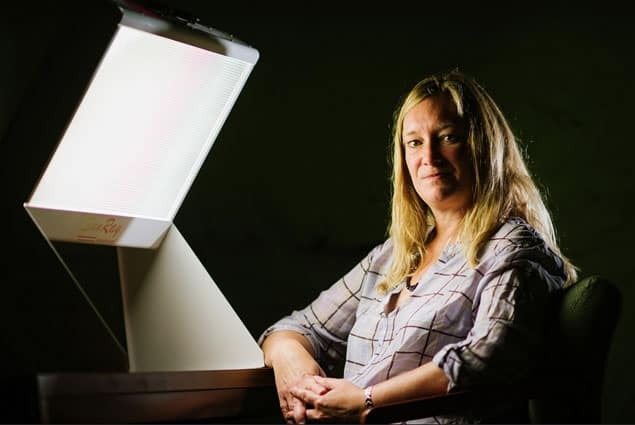 Led by University of Vermont psychology professor Kelly Rohan and funded with a $2 million grant from the National Institute of Mental Health, it is the first large-scale study to examine light therapy’s effectiveness over time. Over 14 million Americans suffer from SAD, ranging from 1.5 percent of the population in southern states like Florida to more than 9 percent in the northern regions of the country. An estimated 10 to 20 percent of all cases of recurrent depression follow a seasonal pattern. In the study, 177 research subjects were treated with six weeks of either light therapy–timed, daily exposure to bright artificial light of specific wavelengths using a light box–or a special form of CBT that taught them to challenge negative thoughts about dark winter months and resist behaviors, like social isolation, that affect mood. Two winters after the initial treatment, 46 percent of subjects in the light therapy group reported a recurrence of depression, compared with 27 percent of those in the CBT group. The study showed that, by the second winter, only 30 percent of light therapy subjects were still using the equipment. Depressive symptoms were also more severe for those in the light therapy group. Cognitive-behavior therapy, by contrast, is a preventive treatment, Rohan says. Once SAD sufferers learn its basic skills it has enduring impact, giving the person a sense of control over their symptoms. But given the difficulty in persisting with light therapy and large number of Americans suffering from the recurrent disorder, CBT may be the better treatment option in the long term, she said.